A few stories back, we had a look at Leonard Liesens' good endurance horse Orfeo Des Iviers: thoughout his 9-year endurance career with Leo he participated in a total of 2 European Championships (Spain/Portugal and France) and 4 World Championships (France, Dubai twice, Germany); made the Belgian team selection 6 times; and won 4 CEI 3-star endurance races, including 2 160-km races, and the 2000 Belgian Championships. They finished Top 10 in the 1999 European Championships in Portugal, Top 10 in the 2000 World Championships in Compiegne, and won the 140-km in Compiegne in 2003. Orfeo's sire, Pedant, is still alive, and standing at Haras Des Iviers in Belgium. Leo took us to see Dr Manu Scohier and his veterinary clinic/farm, and his parent's Haras Des Iviers Studfarm, a beautiful place tucked away in the south of Belgium (in fact, one of their paddocks is in France). Started by Mrs Scohier back in 1978 to produce Arabian show horses, the farm now produces top purebred Arabian endurance horses. Manu's office walls are covered with picures of the successful get of their oldest sire Pedant, including Orfeo, with Leo riding. There's even a picture of Steph on the wall, crewing for Orfeo and Leo, in Dubai in 1998! 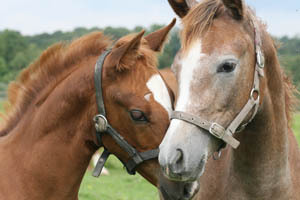 Pedant, a former winning flat racing horse, has produced a number of successful endurance horses throughout his career, including Orfeo and his full sister Opalina Des Iviers. 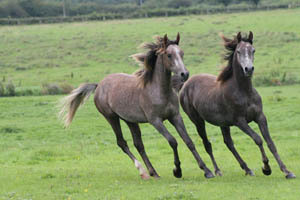 With both of them having won a CEI 2** or 3*** race, this qualifies Pedant as a 4-Star breeding Stallion, a system devised by the French to rank endurance stallions by the quality of their offspring. Pedant still looks good at 27 years of age. 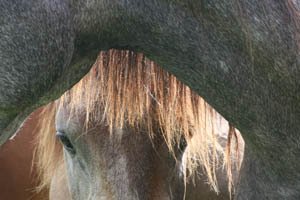 He's a 15.1 hand chestnut, quite sociable – he walked across his pasture to visit with us. They are trying to figure out a way to collect him for AI breeding, to protect Pedant from the risks of live breeding at his age. They tried collecting him on a dummy... but he's decided he won't have any of that. 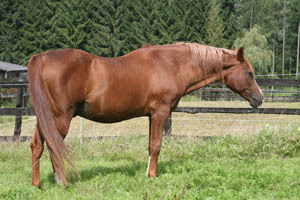 Opalina des Iviers, 15, is a broodmare on the farm now, with a foal by her side. She won a 160 km race at Arlon, Belgium, in 2002. 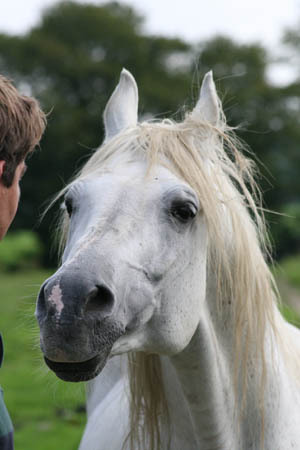 There are two other breeding stallions on the farm, a 4-year-old gray, Pamir El Milora, a son by the Australian stallion Milora Park Blue Fire (now standing at the French National Stud) and out of Movoska (a mare by Persik); and 21-year-old white stallion Waracz. You can still see the charisma that carried Waracz to national halter championships in his younger days in Europe, Sweden, and Scottsdale. Manu sends the older endurance prospects off to be broken and trained and qualified to Jack Begaud in France and his trainers; he also sometimes exchanges stallions with France. This exposes the Des Iviers horses to a bigger audience than what would normally be possible inside just the small country of Belgium. The quality and success of the breeding and training programs is obvious looking at the impressive equines in residence on the farms - babies, yearling, 2-year-olds, and up. See their website at http://www.iviers.com/ , and more photos at http://www.endurance.net/merri/Belgium11/BE3/BE4/DesIv02/index.html .